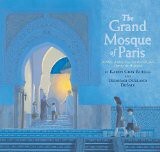 This book outlines how the rector of Paris's Grand Mosque helped save Jewish lives during the Holocaust. Mainly, what the Mosque did was give Jewish people who looked North African new identity paper as Muslims. Other Jews they helped smuggle through the Mosque, through the catacombs, and then out the Seine where they could often take a boat leading to a free area. The details of this story are sketchy, which the authors discuss in the back matter to the book. The Mosque wouldn't let them access their library and most of the information is taken from a documentary made in 1990. It will be interesting to see what information would come out if someone were allowed to use the Mosque's library. The back matter is excellent, containing a glossary, bibliography and recommended reading/watching list. The bibliography and recommendations are broken into media types (Books, Articles, Movies, etc) and those that are appropriate for younger readers are asterisked. Additionally, on the recommended list, after each citation the authors list in parentheses who the audience is for that item. The books is illustrated entirely in oil painting with no photographs, which isn't my favorite but I'm under the impression that there aren't many photographs around that would adequately illustrate the story. Overall an interesting addition to Holocaust literature for younger readers. Looks like an interesting book. As a teacher who uses Holocaust novels, I'm always interested to see picture books relating to very aspects of the Holocaust.